A century after it was first built, Kingscote Gardens opened at the start of the school year as a new space for Institutional Equity & Access and the offices it oversees, as well as Counseling and Psychological Services (CAPS) and the Confidential Support Team (CST). Kingscote Gardens, home to several offices for student services (AXELLE TALMA/The Stanford Daily). Located between the Faculty Club and Harmony House, Kingscote underwent a year-long renovation effort geared toward opening more university offices — in particular, the offices under the Division of Institutional Equity & Access. 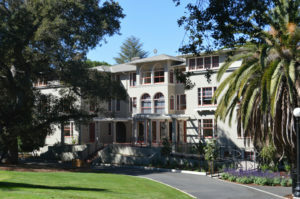 The historic building was first built in 1917 and has housed Stanford affiliates ranging from visiting professors to a Russian revolutionary to author Charles Beardsley, who was forced to leave after writing a novel about the salacious happenings at a fictional apartment complex whose tenants resembled Kingscote residents. The Daily took a tour of the new space to learn more about the offices under Institutional Equity & Access and the CST. Headed by Senior Associate Vice Provost Lauren Schoenthaler, Institutional Equity & Access oversees five offices: Diversity and Access, Ombuds, the Office of Sexual Assault and Relationship Abuse Education and Response (SARA), the Sexual Harassment Policy Office (SHPO) and Title IX. Schoenthaler said Institutional Equity & Access’ goal was to provide a safe environment for all students, faculty, staff and community members to prevent and recover from all forms of harassment, hate and violence. The entrance is a sunlit patio, leading into an atrium with glass windows from ceiling to hardwood floor. The open-concept style makes Kingscote welcoming to visitors, Schoenthaler said. She encourages students to make use of the grounds — for walking, lunch and visits to the office. According to a Stanford News article announcing the renovation, Kingscote was designated to house student service offices. Kingscote held open houses for students and staff during New Student Orientation. The building also has a large meeting space area where they’ve already done a workshop with the Leland Stanford Junior University Marching Band. “Because we have such excellent meeting space here, we are hosting many student meetings and training here,” Schoenthaler said. “For example, the SARA Office and Fraternity and Sorority Life just launched a Yoga as Healing class for student survivors of assaults on Tuesday evenings in Kingscote. Just up the first flight of wooden steps is Schoenthaler’s office. She encourages students who have a concern — whether about sexual health, discrimination, mental health or institutional response — but don’t know where to go, to come and visit. Schoenthaler explained that her office can be an ongoing resource should students decide to take the next step and talk to one of the other offices under Institutional Equity & Access. Formerly separated, the office of Institutional Equity & Access helps bring its umbrella offices closer together, aiding with referrals and helping students find the best resource for their needs. Schoenthaler approximated that 65 percent of her work has surrounded sexual harassment and violence matters, with the remainder of her time being devoted to diversity and access programming as well as responding to concerns. Additionally, Schoenthaler also provides trainings and creates projects in collaboration with other offices, such as a website to help students navigate finding support after dealing with sexual violence. Across from Schoenthaler’s office is the SARA office, where students, faculty and staff can learn about resources for preventing and remedying issues related to sexual assault and sexual health. Director of SARA, Carley Flanery, said SARA’s main goal is to educate the Stanford population about handling issues related to sexual health, assault and prevention. SARA is in charge of dorm workshops and educational programs, such as Beyond SexEd, and collaborates with the other Institutional Equity & Access offices to find help for students who reach out in need of support. SARA can also act as an intermediary for both Title IX and outside legal issues, such as ordering restraining orders. Students are welcome to walk into the office with questions. The SARA office is not confidential — if there is evidence of prohibited conduct, students, staff and faculty will be referred to Title IX. Flanery said she was excited to move into Kingscote to have a new creative workspace where students can work on projects related to sexual health education. In the back of the SARA office is a decorated student workspace where student staff, volunteers and leadership can work together to design workshops and outreach materials. Title IX offers resources for recovery, also located in Kingscote, and will conduct investigations when necessary. If students feel they should report to Title IX or are curious about the Title IX process, Outreach and Student Resources Coordinator Miranda Tuttle said there are a variety of resources to go through — such as calling, emailing, using the Callisto app or going through other offices — but that walking into the office is just as good an option. Across from Title IX is SHPO, where Associate Director Nanette Andrews encourages faculty and staff to voice community concerns about sexual harassment awareness and prevention. SHPO provides faculty and staff with education on how to help students dealing with issues related to sexual health and assault. “Our focus, especially lately, is on how to appropriately respond to students who have issues in the Title IX space,” Andrews explained. “Educating the entire community is really important — not just students — faculty and staff tend to be a good resource to students, so we are very active in making sure the entire community is educated. For students looking for confidential support, the CST is located just upstairs from Title IX, where Helen Wilson, director of the CST, said her team is available to help students affected by sexual assault, relationship or gender violence, discrimination or stalking. The waiting area aims to give students who need same-day urgent appointment assistance a comfortable space to spend a few moments. CST provides counseling and evidence-based psychotherapy. CST has a 24/7 hotline for students requiring immediate counseling outside of business hours. Also on the third floor is the University Ombuds, David Rasch, who offers confidential, informal assistance to anybody in the Stanford community who has an issue, conflict or concern with life, from classes to living situations. Rasch said his job is to resolve differences, act as an intermediary for disputes and offer advice on any range of issues. The Ombuds, an impartial appointee aimed to resolve complaints, said he has students come in for a variety of issues, from academic grading complaints to conflicts within student groups to fees or tuition discrepancies. Rasch stressed that he is a confidential resource — unless there is evidence of an imminent physical threat or harm. Located on the first floor, the Diversity and Access office offers Americans with Disabilities Act (ADA) compliance as well as reviews public accommodations, employment and nondiscrimination support for faculty and staff. Diversity and Access takes care of accessibility for students needing accommodations for dorm trips or living situations. Although students generally go straight to the Office of Accessible Education (OAE) for support, the Diversity and Access office is also a resource for students seeking assistance. “Not only do they have a legal right, Stanford is absolutely committed to making sure they can have whatever opportunity or experience that is available to other students,” said Rosa Gonzales, director of Diversity and Access. Additionally, Diversity and Access offers nondiscrimination education for faculty and staff and will help remedy situations where community members feel they are being discriminated against.